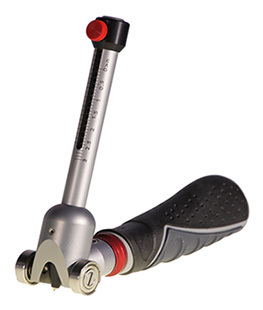 The Hardness Test Pen is a pocket instrument for testing the hardness and wear/scratch resistance of materials such as coatings, lacquers, plastics or related products. A tungsten carbide tip is drawn over the surface with a defined constant pressure. 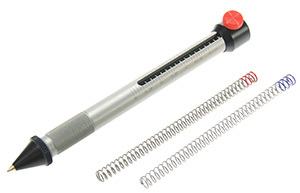 The pressure on the tip can be changed using the slide or by changing the spring. A visual mark on the surface after use of the Hardness Test Pen indicates a fail of the surface hardness or wear/scratch resistance. Can be used on flat and curved surfaces. Ergonomic design with anti-slip texture on the holding point. Made of maintenance-free anodised aluminium, tips in tungsten carbide. Release the red knob on the slider and set the slider to the required position and fasten it by turning the red knob clockwise. (Note the beveled edge of the slider indicates the correct position). Place the tester perpendicular on the surface to be tested and press the holder, using light force, in order to create load on the tip. The black guide tip should not touch the sample. Move the tester over the surface over a length of about 10 mm with a constant speed. Observe the surface to check for visible marks as indicated by standard.